As I leave my last Jaipur Literature Festival event, I get a frantic phone call from my friend Shampa. We had come to the city together, along with her family and had split for the morning to pursue our respective interests. She tells me they are stuck in traffic and cannot come get me on the way back to Delhi. We had aimed to leave the city at noon. 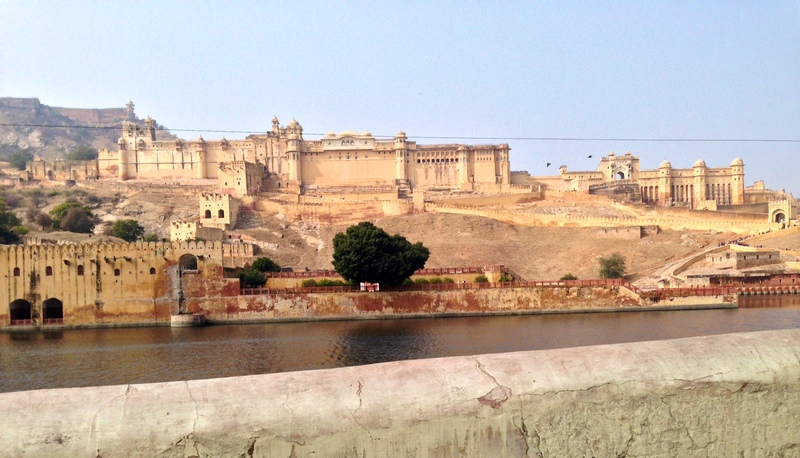 It is 12:13 pm already, and I am a good 15 kilometers away from the proposed meeting spot – “where the elephants are at the Amer Fort.” She asks if I can take a cab to meet them, and I tell her it’s no problem. When I leave the festival area, I see no taxis, only auto-rickshaws. As one pulls over to let two girls out, I ask him if he knows the site of my rendez-vous with Shampa. He nods. “Meter or fixed rate?” I ask. He offers me a fare of 200 Rupees, and I accept. The driver sits with his bottom on the far right hand side of the seat, and his arms slightly at an angle to grasp the handlebars at the centre, which makes him appear as if he is in some sort of corporate yoga pose. The ride is rickety, and hits potholes so hard I soar off my seat with each bump. We approach an archway amidst heavy traffic, and I spot a bare dusty foot poking up from the ground, perilously close to the rolling tires. As we get closer, I see that the foot belongs to a man passed out under a beige cloth. I wonder if he is passed out drunk or has simply fallen asleep. Sensing my curiosity about what is going on outside, the driver interrupts my thoughts to speak. He is telling me we are passing through the Pink City, because “everything is pink.” Personally, I think the pink city looks more orange-brown (one of those hues with a fancy name like burnt autumn or something) but it has a rustic charm to it. The streets are lined with general food stores, fruit and vegetable stands, and for some reason multiple stores with colourful children’s bicycles wrapped in plastic. Packets of Pan hang down, swaying in the breeze. This continues for many blocks. As we drive, the Pink City turns white and yellowish. The roads get bumpier and there is the frequency of air between me and my seat shoots up. I am amused when I realize what the shaking reminds me of: those vibration machine abdominal workouts that have become so popular. You know the ones where you stand on the machine passively and let it shake you like a Snapple bottle before opening, which allegedly trims down your waistline? Yup, that’s pretty much what it feels like. I debate keeping my core engaged, and I forget before I have a chance. We leave the Pink City onto thankfully smoother roads. An elephant walks past us on the other side of the road. We hear a musical horn wailing at us, and the driver pulls into the left lane just as a heavily painted truck blows past us. We drive past Maharani Ki Chhatri, and the driver enthusiastically tells me he will show me where to buy “Rajasthani dress.” In my mind, we will just be driving through an interesting neighbourhood, and my heart sinks when he pulls up into a store and parks. When I get out, a very enthusiastic fellow welcomes me and ushers me to a small table set up right by the parked auto, outside the store. On it sits a clear plastic container with small squares of what looks like muslin fabric, and two trays, one with green liquid, and one with yellow. There is also a bowl of water and a jar of beige powder. Blocks are scattered across the left hand side of the table, each with a different design. He gestures to the liquid trays, and explains to me that these are all vegetable dyes, using spinach and other things. With gusto, he sticks a block into the green liquid and carefully places it on the fabric. With a karate chop he removes the block to reveal the outline of some sort of bird, perhaps a chicken. He then places another block into the yellow dye and repeats his martial arts blow. When he removes the shape, the inside of the chicken is stained yellow. I feign amazement, as I have seen block-printing demonstrations several times before. I think the demonstration is over, and am relieved as I am itching to get back on my way. But he is not yet finished with me. He mixes a spoonful or two of the beige powder into the water, dips the fabric in. The fabric stains red, but the colors on the chicken stay intact. In addition, he allows me to touch the dripping fabric but none of the dye stains my fingers. Although I am impressed by this rudimentary color-fastness I am more concerned about how much of a cut my auto guy gets from any purchases I make here. I fidget a bit wondering how to get out of this. When he invites me in to look inside the store, I tell him how sorry I am that I’m in a hurry, and will definitely return this afternoon after meeting my friends. I am a terrible liar, so he looks a bit skeptical but agrees. He asks me where I am staying and this time the fib slides out of my mouth so easily, I impress myself. I say I am staying with friends, knowing he will gauge how pushy to be based on assumed room rent per night. Since we booked last minute we had few choices but the very expensive, and I am not really eager to reveal this. I say my goodbyes and get back into the auto. The auto driver doesn’t seem too perturbed at my early exit, and I am relieved at this, as I’m counting on him to get me the rest of the way up to the fort. We pass the Jal Mahal, and it is gorgeous. I am sad that I am cutting the trip short, because there is so much else here I would’ve liked to have seen. The driver stops to get petrol, so we are further delayed, and I find myself growing impatient to get there. As we start again, the road is wider and even smoother than before. We see camel rides on the left, and a two-wheeler almost collides with us going the wrong way. Traffic thickens again and we slow to a crawl. The smooth surfaces are done for the day, it seems. I realize that the vibration abdominal workout effect must be working, because I am suddenly famished. We start climbing uphill and then suddenly traffic just stops. There is one lane of traffic for each direction, but nobody is moving. A police car labeled “interceptor” arrives and within minutes the traffic starts moving again. We don’t know what you did, but thank you JPP, you are magic. A short while later, we are directed to take a sudden left turn off the main road. The alternate route is lined with cobblestone and steeply inclined. I begin my involuntary abdominal workout again. Cobblestones give way to jagged rocks and stones, and my auto driver and the rest of the people on the road struggle to maintain solid traction. Several cars get stuck, but fortunately most are traveling in the other direction, and do not hinder our already turtle-speed progress. It’s bumpier than ever before and I pull my bags close to me so they don’t fly out. My seat has become like a trampoline: as the tires hit the rocks, I fly higher and higher off my seat. The path carries on for 10 minutes, 15 minutes, how long I’m not sure. Somewhere along the way I spot a gaping hole in the path next to us with a giant pipe lying exposed. That is never a good sign but I trust the good people of Jaipur have it all under control. After this, back on regular paved road, and before long, back in a jam. When I ask my auto driver about the traffic, he says that it’s never this bad – that it was additional traffic due to the long weekend and the literature festival. By the end the only thing I can do is laugh. My 30-minute ride to meet my friends has taken over an hour, but I’ve seen and felt some very interesting things along the way, and in spite of the involuntary pit stop, I’ve grown rather fond of my tour guide driver and his weird sideways seating. There are few other countries that, in a simple pursuit of traveling from point A to point B, could offer an impromptu tour complete with pit stops, rustic routes and attempted scams. Sometimes it is truly the random and the unplanned that make a trip what it is. In this case, it certainly was. Yes, there is magic in the simplest of things, and sheer boredom in planned events. Ha ha! I really enjoyed reading this. You write really well, and free flowing. I would imagine an auto ride in any part of India is an interesting write, not to mention Chennai where they specialize in racing you from point A to B, while charging you for Z.